When young Phillip Pirrip, nicknamed Pip, meets a strange, reclusive lady called Miss Haversham (Maxine Audley) it opens up a new world of possibilities. 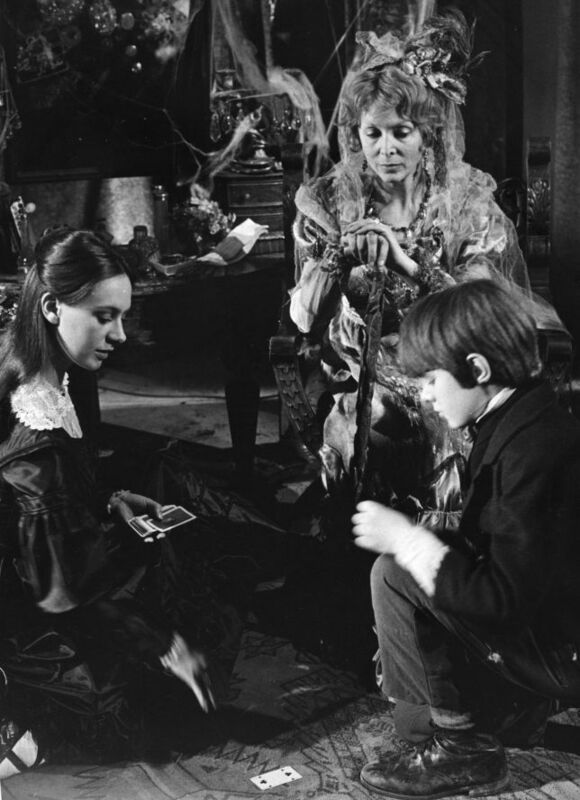 Miss Haversham’s ward, the beautiful Estella (Francesca Annis), bewitches him from the first time they meet, although she is unable to return his love. As the years pass by and the boy grows into a man, Pip learns that he has “great expectations” and will shortly come into the possession of a handsome property. Since his most heartfelt desire is to become a gentleman (only then, he believes, will he be able to win Estella’s heart) it seems like a dream come true. So he moves to London and at first all seems well. But later he receives a shock – his anonymous benefactor turns out not to be Miss Haversham after all, but a convict named Magwitch (John Tate) …. Originally published across 1860/61, Great Expectations was Charles Dickens’ penultimate completed novel (Our Mutual Friend and the incomplete The Mystery of Edwin Drood would follow). A popular success at the time of its original publication (unlike Our Mutual Friend, which received a much more muted reception) Great Expectations has proved to be one of Dickens’ most enduring works. Its popularity can be judged by the number of film and television adaptations it has inspired. Great Expectations made its debut in the cinema all the way back in 1917, whilst on television the 1959 BBC adaptation, with Dinsdale Landen as Pip, was the earliest. Sadly, the 1959 Expectations is missing one of its thirteen episodes (episode eight) so it looks unlikely to be released on DVD. Some eight years after the BBC first tackled the novel they did so again – with this 1967 ten-part adaption by Hugh Leonard. Since so much of the impact of Great Expectations comes from the travails of Pip, strong casting of the character is essential. Luckily this production managed the feat twice – Christopher Guard played the young Pip, whilst Gary Bond took over when he reached adulthood. Guard had already appeared as David Copperfield the previous year, so was clearly well versed in the world of Dickens. Bond had racked up a varied list of credits since his screen debut in 1962 (including a notable film appearance in Zulu as Private Cole). The first episode opens with Pip’s graveyard encounter with Magwitch. It’s a sequence that required a certain amount of skill on the part of the vision mixer, due to the way it frequently cuts from film (establishing shots of Pip) to videotape (the studio dialogue between Pip and Magwitch) and then back to film again. It’s a pity that the entire scene wasn’t shot on film, but presumably this was a matter of cost. There’s more filmwork across the serial than there was in Our Mutual Friend, but the studio scenes still dominate. 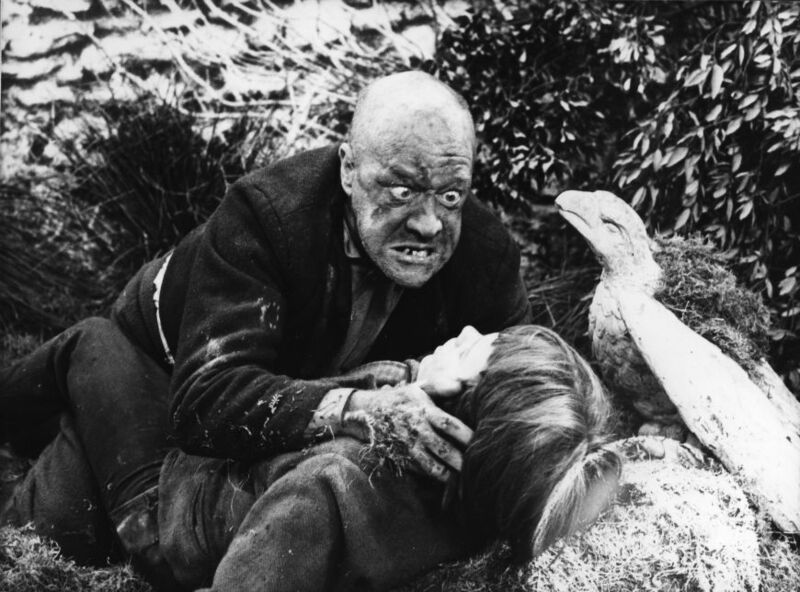 John Tate makes for a menacing Magwitch, although even in this intial scene there’s a feeling of conflict in his character. He might issue bloodcurdling threats against Pip, but he also holds him close in a way that almost seems to be tender. And when he’s later recaptured (Tate excellent again here, mudcaked and weary) he chooses not to mention that he forced Pip to fetch food for him. Young Pip’s homelife is pretty grim. He’s abused by his sister (played by Shirley Cain) although her husband, Joe Gargery (Neil McCarthy), is a much more genial – if simple-minded – chap. McCarthy, like so many of the cast, impresses with a deftly sketched performance. Sound effects and music are prominent right from the start. The music is dramatic (possibly over-dramatic at times) although the sound effects are more successful in creating mood and atmosphere. The constant wailing of the wind throughout the early episodes helps to create the impression that Pip lives in a cold, desolate and foreboding area. Visual signifiers – a rotting corpse hanging on a roadside gallows – reinforces this. If Pip’s first meeting with Magwitch is a signature moment, then so too is his initial encounter with Miss Haversham. As Pip approaches her intimidating house the music swells and then abruptly cuts off as Pumblechook (Norman Scase) lays a hand on him. This could be intentional, although it seems more likely that it was a grams error. Whilst Maxine Audley’s Miss Haversham is muted to begin with, the meeting between her and Pip still has a uncomfortable, off-kilter feeling. Not least because of Francesca Annis’ cold and abusive Estella who treats Pip with the utmost contempt. Christopher Guard gives a very internal performance as Pip. Since he’s only a young boy (and one you can imagine has beaten into obedience from a very early age) Pip is unable to talk back to his elders and betters. So Guard has to either suffer in silence or express his true feelings somewhat obliquely. The third episode – Apprenticeship – sees the mantle of Pip pass from Christopher Guard to Gary Bond. It’s done in a visually striking way as we see Pip, apprenticed as a blacksmith to Joe, toiling in the forge. Overlaid smoke effects and mournful music create a weary mood as the camera moves down to focus on the metal he’s hammering. And when it moves back up, the boy has become a man (thereby not only solving the problem of how to move from one actor to another, but also neatly suggesting that Pip has spent years in a form of statis – doing the same thing, day-in and day-out). Great Expectations boasts many fine performances across its ten episodes. Ronald Lacey casts a menacing shadow as the drunken and violent Orlick (who, like Pip, starts off as an apprentice to Joe) whilst Hannah Gordon radiates honest goodness as Biddy, a maid who helps to keep Joe’s household together after Mrs Gargery is left insensible after a violent attack from an unknown assailant. The always dependable Peter Vaughan has a nine line in icy disdain as Mr Jaggers, the solicitor who informs Pip of his great expectations. Bernard Hepton, another fine actor, plays Jaggers’ clerk, Wemmick, a much more approachable and amusing fellow. After they’ve become better acquainted, Wemmick takes Pip on a tour of his house – a wonderfully eccentric creation which features a drawbridge, waterwheel and a gun on the roof (which he fires every day at 9.00 pm). And all this in the heart of London! Pip remains a curiously unlikable character for most of the serial. His desire to better himself and become a gentleman is generated purely by the hope it will win Estella’s approval (although given her utter indifference for him, he seems doomed to failure). Her mocking laughter at the end of the fifth episode – The Betrayal – shows that while Pip may have changed, she hasn’t. Unlike some of Dickens’ other novels, where you sensed that the author approved of and supported his hero, there’s a much icier feeling here as well as a deep sense of melancholy. The seventh episode – Pip’s Benefactor – helps to pivot the story into new and unexpected directions. The return of Magwitch is heralded by a brief burst of icy wind on the soundtrack (a nice, understated nod back to their initial graveyard meeting). Pip’s horror that Magwitch is his benefactor is plain to see. Is it because Magwitch, although wealthy thanks to his efforts as a convict in Australia, is still somewhat uncouth? Or does it have more to do with the fact that transportation is a life sentence and so by returning to England, Magwitch faces certain death if he’s caught? Initially there’s no doubt that he’s somewhat repulsed by Magwitch but eventually he acknowledges the sacrifices the older man had made for him, which is a key moment (from this point on Pip becomes much less self-centered). Alan Bridges peppers the ten episodes with some interesting directorial flourishes. Miss Haversham’s mausoleum of a house offers plenty of unusual camera angles whilst elsewhere (Mr Jaggers’ office, for example) the use of projected light helps to create striking shadows on the wall. Miss Haversham’s death in episode eight is another standout moment, although like Pip and Magwitch’s first meeting it’s puzzling that the scene (mostly shot on film) still has a few brief videotape inserts. This adaptation of Great Expectations has no weak links on the performance front – Peter Vaughan, John Tate, Bernard Hepton, Richard O’Sullivan, Neil McCarthy, Francesca Annis and Maxine Audley are especially noteworthy – whilst both Pips, Christopher Guard and Gary Bond, acquit themselves well. Bond is especially impressive in the closing episodes as Pip faces one reversal of fortune after another, although they do help to deepen and strengthen his character. The prints are of a pretty consistent quality throughout – there’s the occasional sign of dirt and damage, but given that the materials are some fifty years old that’s not too surprising. In general the picture is clear and watchable although there’s always a slight drop in quality during the film sequences (not surprising, due to the way that the film inserts would have been telecined in during the recording session). 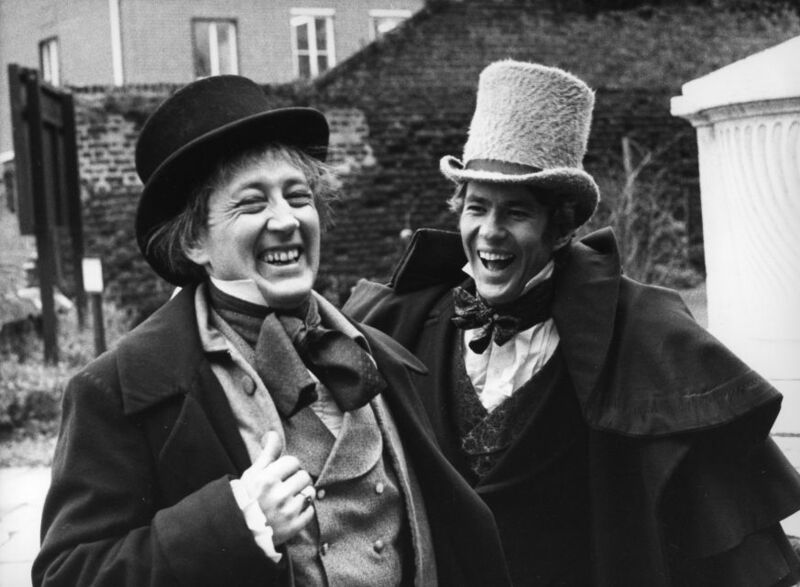 Even with so many different adaptations of Great Expectations jostling for position, this 1967 serial – although it may lack the budget and scale of some of the others – is still worthy of attention. Tightly scripted and well acted, it’s a very solid production which still stands up well today. Warmly recommended. Great Expectations is released by Simply Media on the 3rd of July 2017. RRP £19.99. It can be ordered directly from Simply here. Sydney Wing (Christopher Neame) and Anderson (Neil McCarthy) have both recently been released from prison, but that’s where the similarity ends. Wing has the sort of casual, upper-class air which ensures he can easily mix with the highest in the land whilst Anderson hails from a much lower rung of society. But whilst they’re very different people, both are selected by the mysterious Mr Laxworthy (Bernard Hepton). Laxworthy has a proposition – he wants Wing to pose as a rich man-about-town whilst Anderson takes the role of his valet. And since both Wing and Anderson are penniless they readily agree (especially when Laxworthy tells them there’s a fortune to be made). Edward Phillips Oppenheim was a highly prolific author, penning more than a hundred novels between 1887 and 1941 as well as numerous short story collections. Dubbed “the prince of storytellers” he was a pioneer of the spy-fiction genre – although like many of the authors featured in The Rivals he slipped into obscurity following his death. The Secret of the Magnifique was one of a number of short stories collected in the volume Mr Laxworthy’s Adventures, which was published in 1913. It can be read here. Bernard Hepton is a great, albeit rather underrated, British actor. His fairly low profile, despite his impressive list of credits, may be partly due to the type of characters he usually plays. They don’t tend to be flamboyant or demonstrative – Hepton specialises in self-contained, internal performances. So he’s never going to be an actor that commands the screen, he’s much more subtle than that. The 1970’s were something of a golden period for him. He took the lead in two WW2 series produced by Gerard Glaister – Colditz, in which he played the Kommandant and Secret Army, which saw him switch sides to take the role of Albert Foriet, a member of the Belgian underground network “Lifeline” (which was dedicated to returning Allied airman to the UK). 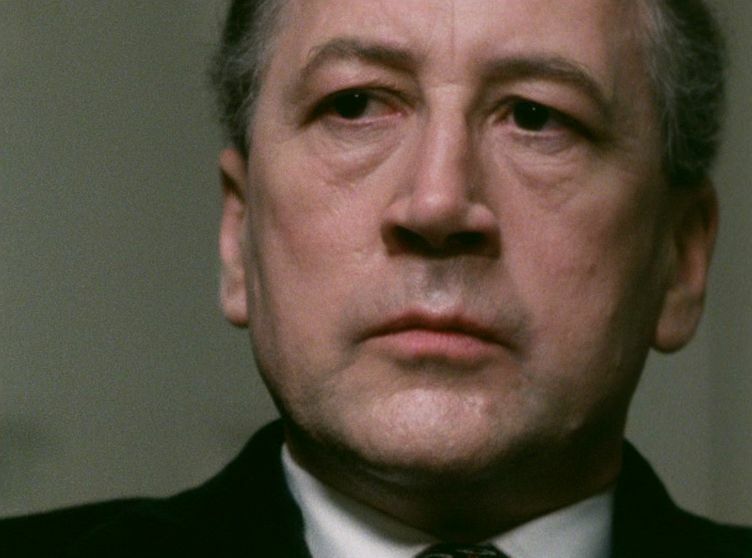 Other notable series, such as I Claudius and Tinker, Tailor, Soldier, Spy were also graced by his presence and there were numerous one-off appearances, such as this one. Our first sight of Hepton is as the cabby who picks up both Wing and Anderson. Had there not be a caption-card at the start, proclaiming Hepton as the star of the episode, then this slight misdirection might have worked a bit better. As it is, when Laxworthy takes off his cabby’s overcoat and removes a fake moustache it doesn’t really come as any sort of surprise. But it does give us an early indication that he’s a man who likes to be in control and also enjoys manipulating people. 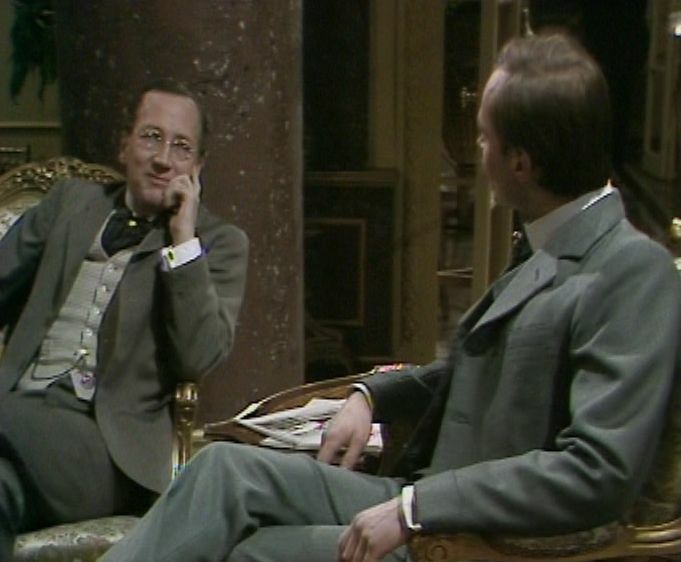 Christopher Neame had also starred in Colditz (and would appear in the first series of Secret Army too). His trademark charm is on display here, making it obvious why Laxworthy selected him. Neil McCarthy is present for a spot of comic relief – Anderson is a rough, gruff sort of chap who’s inclined to blurt out the wrong thing at the wrong time. The Secret of the Magnifique offers something of a change in pace for The Rivals, as there’s no detective (Laxworthy loosely fulfills this role though). But whilst Mr Laxworthy might not be an honest man he’s not a totally dishonourable one either. He makes a handsome profit from the secret of the Magnifique’s torpedo, but it’s maybe not in the way one might have expected. Elsewhere in the cast, the likes of Gary Watson and John Nettleton adopt French accents of varying accuracy whilst Canadian-born Bruce Boa plays an American, Freeling Poignton. Boa was one of a handful of Canadian actors resident in the UK during this time (Shane Rimmer was another) and this small band of ex-pat Canadians were able to earn a very good living by playing Americans. And at least their accents always sounded convincing! The Secret of the Magnifique is one of those episodes that leaves you wanting more. Hepton, Neame and McCarthy make an entertaining team and a run of further adventures would have been very welcome. As mentioned previously, it’s strange that The Rivals was never used as a series of pilot programmes since a few episodes, including this one, could have spawned their own series. Unfortunately it wasn’t to be. Or it may be because of what he knows about the Jim Prideaux shooting. Westerby was in Czechoslovakia at the time and he learnt that “the Russians moved in on Saturday, it was the day after they got Jim. Russians knew the lot, knew he was coming. They were lying in wait for him. Bad story, you see. Bad for big chief. Bad for tribe.” When Westerby returned to England he told Toby Esterhase, but Toby professed not to believe it, dismissing it as nothing more than drunken ravings. It’s a lovely cameo from Ackland and Guinness is his usual excellent self. Whilst it’s clear from the outset that Westerby wouldn’t necessarily be Smiley’s first choice as a lunch companion, he’s easily able to tease the information out of the newspaper man. As always, Smiley asks many more questions than he answers – witness the end of lunch, as Westerby wonders exactly what Smiley’s been after. Guinness remains inscrutable, offering very little. At one point, rather than commit himself, he smiles – and the camera remains on him as the smile slowly fades away. Tight close-ups (switching between Ackland and Guinness) are used in this scene, very effectively. As they finish their lunch, Westerby muses about Toby Esterhase. Westerby: Rum chap, Toby Esterhase. Westerby: God, brilliant! First-rate chap! But rum. If Smiley has tended to be mostly passive so far, eliciting information rather than sharing it and not expressing too many of his own opinions, that changes once he confronts Toby. It’s the first time he’s spoken to one of the four suspects and it signals a major turning point in the story. Toby meets Guillam at a safe house – apparently to see a potential agent – but instead he’s met by George Smiley. Now it’s Smiley who does the majority of the talking, whilst the camera closes in on Toby’s increasingly pained face. Guinness is, once again, excellent, as he’s able to fillet and humiliate Toby – but in the most gentlemanly way. George Smiley: Ever bought a fake picture, Toby? Esterhase: I sold a couple once. Smiley: The more you pay for it, the less inclined you are to doubt its authenticity. Eventually it becomes clear to Toby that source Merlin, and his London representative Polyakov, has deeply compromised the Circus. He’s desperate to assure Smiley that he knew nothing about it, as well as downplaying his own involvement. Esterhase: Why pick on the little guy? Why not pick on the big ones? Percy Allenine, Bill Haydon! Guillam: I thought you were a big guy these days. Smiley: You’re the perfect choice, Toby: resentful about slow promotion, sharp-witted, fond of money. With you as his agent, Polyakov has a cover story that really sits up and works. The big three give you the little sealed packets of chickenfeed, and Moscow Centre thinks you’re all theirs. The only problem arises when it turns out you’ve been handing Polyakov the crown jewels, and getting Russian chickenfeed in return. If that’s the case, Toby, you’re going to need some pretty good friends. Like us. Gerald’s a Russian mole, of course. And he’s pulled the Circus inside out. Afterwards, Smiley commiserates with him. “Poor Toby. Yes, I do see, what a dog’s life you must have had running between them all.” It might be just another scene of people sat in a room talking, but in the context of the story it’s riveting stuff. The result is that Smiley’s happy to discount Toby as a suspect, so that leaves the other three.